Who would have thought Kuu Cafe is a hidden gem at the corner of Park St, South Melbourne. Not located where the hustle and bustle South Melbourne Market is, you’ll have to wonder out to find this cosy Japanese kitchen nestled in a house. A few tables for outdoor dining but you’d want to sit indoor to be in that vibe – listening the kitchen do its cooking and enjoying the intricate interiors that makes this a Japanese kitchen. What surprised me was that they put their logo on the matcha latte. When drinking the latte, the kuu stays but like a scream face 🙂 – a pleasant surprise. Their matcha latte tends towards the sweet end. Different, but I still like it. I haven’t had a good matcha latte in South Melbourne. 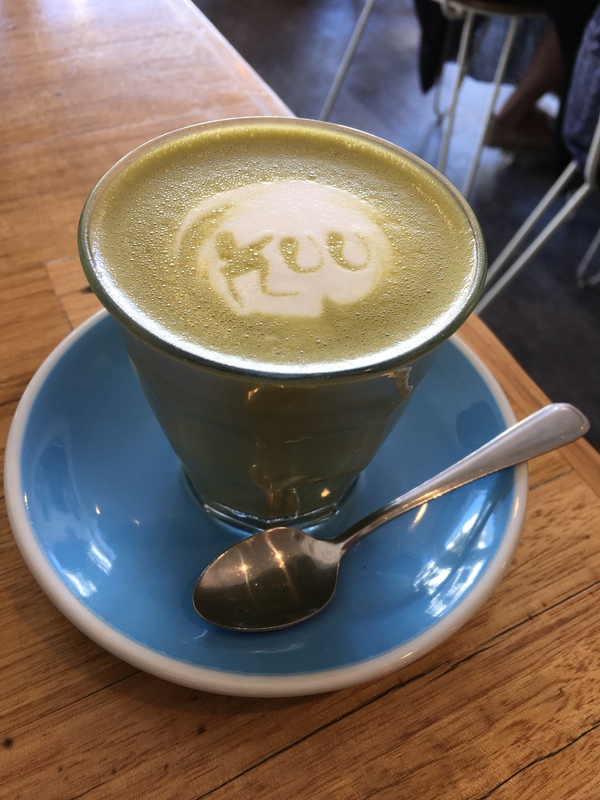 So if you’re in need of a matcha kick in South Melbourne, Kuu Cafe is your pick. Takoyaki balls are my favourite when it comes to a Japanese restaurant. So I had to order it for tasting! $5.50 for 4 balls is reasonable, and they seem to prepare this from scratch upon order. It took them a while to get it to us. When biting through the ball you know it’s a good Takoyaki when you can see the cubed octopus inside. These were decent sizes too. I found them bouncier than usual, but I think it’s because they made it fresh and didn’t put the octopus with the paste pre-made. For mains I ordered the Tempura Prawn Soba noodles (hot) – $14.50. Soba noodles were cooked just right but the soup was a little bland for my liking. I know soba noodles isn’t meant to be packed full of flavour… so I’ll leave this alone. Tempura were perfect. Crispy at every bit even if it was soaking up some broth. I enjoyed it very much. If only there were more! The vegan option would be to go with the tempura veggies with soba noodles. Lastly, J had the Grilled Chicken Curry – $15.50. It was another beautifully grilled protein. Flavoured and tender chicken. J spotted that accompanied with brown rice. Curry is the typical sweet based tomato curry you get in Japanese cuisines and it passed J’s tasting. Fried Egg was something added – $2.50. Overall, I’d give it a big LIKE, based on the quality of the food and I feel everything has put heart and thought into it. We noticed they do their desserts themselves – some places outsource their desserts. Knowing this, it adds more to a family cafe.